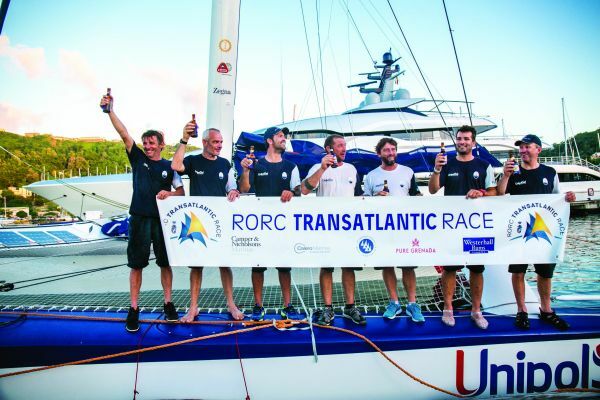 At exactly 20h 54’ 23” GMT (16.54 local time) on Saturday, 3 December, Maserati Multi70 sailed across the finish-line of the third RORC Transatlantic Race, just off Camper & Nicholsons’ Port Louis Marina on Grenada, to complete her first ocean race in a time of 7 days, 8 hours, 44 minutes and 23 seconds. Having cast off from Lanzarote at 12.10 GMT on November 26, Giovanni Soldini and the Maserati Multi70 team opted to skirt the island of La Palma to the north on their first night at sea. This choice impacted the rest of their race and allowed Phaedo3, which rounded the island to the south, to take what proved to be an unassailable lead. Immediately after jumping ashore, Giovanni Soldini had this to say about the experience: «It was a fantastic race. We’re delighted to have arrived into Grenada with Maserati Multi70 in excellent shape. We would have liked to compete up close with Phaedo3, but on the first night out, we made different route choices without having their position from the AIS (Automatic Identification System): passing Las Palmas on the windward side to the north seemed the less risky choice to us to avoid ending up in the wind shadow of the island. But it turned out we were wrong as it took us into a zone with less wind. Our American friends, who were to the south, took off like a rocket, however. When we received their position the following morning, we were 100 miles behind. The northerly route, which we had no choice but to follow at that point, also turned out worse than the southerly one». «The Trade Wind conditions that form, arriving here with a high pressure area and a not-too rough sea are ideal for getting a boat like ours to fly: we made an average of 24 knots with peaks of 40 and had one blistering day when we were powering along consistently at over 30 knots. We are very happy with everything we learned about flying, by using an L-foil in the open ocean. We’ve found a way to use it both when there’ s too much wind and wave, and in other more changeable conditions when it is possible to fly». Giovanni Soldini was flanked aboard Maserati Multi70 in the RORC Transatlantic Race by a team comprising Guido Broggi, Jean-Baptiste Vaillant, Carlos Hernandez, Oliver Herrera, François Robert and Francesco Malingri. The American trimaran Phaedo3 crossed the finish-line at 01.49 GMT of Saturday 3rd of December, to take line honours in the multihull (MOCRA) class, having led the 14-strong fleet for all 2,865 nautical miles of the race.